This carefully crafted ebook: “The Complete Pat of Silver Bush Series: Pat of Silver Bush + Mistress Pat” is formatted for your eReader with a functional and detailed table of contents. Pat of Silver Bush (1933) is a novel written by Lucy Maud Montgomery, noted for her Anne of Green Gables series. It portrays a girl named Patricia Gardiner, who hates changes of any kind and loves her home, Silver Bush, more than anything else in the world. She is very devoted to her family: her father and mother, her brothers Joe and Sid, and her sisters Winnie and Rachel. The book begins when Pat is 7 years old and ends when she is 18. 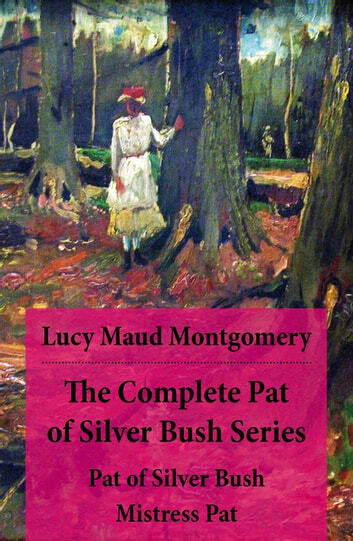 This book has a sequel, Mistress Pat (1935), which describes Patricia Gardiner's life in her twenties and early thirties, during which she remained single and took care of her beloved home, Silver Bush. Pat hated changes as much as ever, and found in Silver Bush a refuge where she was shielded from them, but changes happened nevertheless. In the course of eleven years, new servants, new neighbors and new lovers came and went, her brothers and sisters all got married, and life at Silver Bush was no longer as pleasant as before, but Pat clung to her love of it desperately. It was only in the face of horrible disasters that Pat found where her heart belonged for the rest of her life.